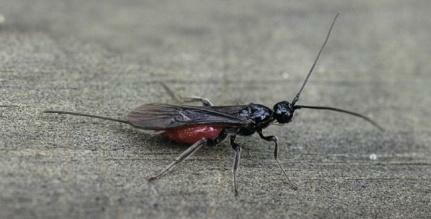 Region: This particular wasp has many species that exist throughout North America and Europe. Life cycle: Several generations per year are common. Generally, species of this wasp hibernate as larvae or pupae in their hosts, such as Caterpillars. Physical Description: Harmless to humans and animals. Species can vary in color from yellowish, black, or red and are usually 1/10 to 1/4 inches long. The eggs are laid in the bodies of host insects, where the white worm-like larva develops. Feeding characteristics: The Braconid is among the most important of the aphid parasites, as well as, the larvae of butterflies, Sawflies, moths and many beetles. 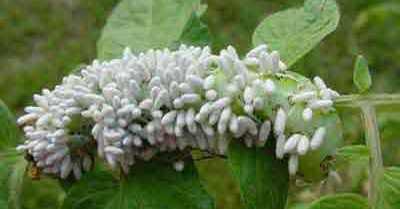 If you see any hornworms or caterpillars with cocoons covering it, don't remove it from your garden, it has been parasitized. This wasp will attack various caterpillars or aphids. The adults feed on the nectar from the flowers of weeds and flowers of the daisy (Chrysanthemum) and carrot (Umbellifers) families. They are sold commercially as eggs. They prefer humid conditions, with the temperatures above 59 degrees.